Only heartwood is naturally durable. As a tree grows, cells in the centre of its stem die after extractives are deposited to form heartwood. Extractives are the key to durability. The amount of these organic compounds varies between trees: trees with high extractive content have a good chance of being naturally durable. Both the amount of extractives and the amount of heartwood in trees is highly variable. As only heartwood is durable, heartwood volume will ultimately determine the value of a stem. 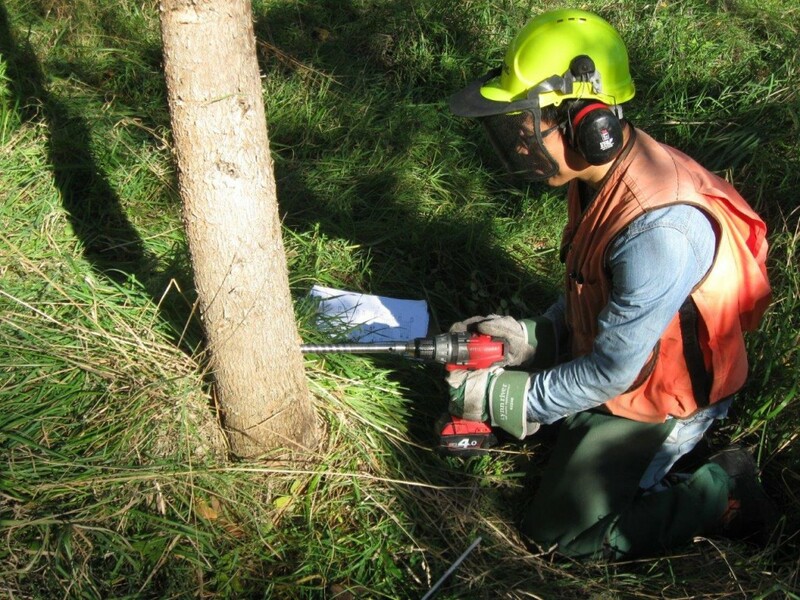 Our research involves developing novel techniques to extract cores from very young trees. We have designed a new coring tool with the help of the Callaghan Innovation. We have commenced sampling and analysing hundreds of samples from our breeding population. Extracted cores are taken back to the lab where we then measure the amount of extractives in each core using near-infrared spectroscopy. This means we can identify the trees with the highest levels of extractives at a young age. This will be an ongoing process as the various species within our breeding populations get to age 6 -7 so that coring can be undertaken. PhD researchers working on aspects of wood quality are Gayatri Mishra and Yanjie Li.